North Dakota has more than a million acres of public land, most of it in western North Dakota, our Little Missouri National Grasslands, managed by the United States Forest Service. Most of it is grazing land, although it’s grazed by more than cattle and sheep. Pretty much every creature that lives in North Dakota has a presence there. For some—mule deer, sharp-tailed grouse, sage grouse, prairie dogs, coyotes, bighorn sheep, pronghorn antelope, and countless species of birds, including our state bird, the Western Meadowlark—it is critical habitat. Studies done by state and federal agencies and numerous wildlife organizations confirm that most of those species are stressed. Some are in danger. As recently as 40 years ago, more than half of those million acres were wild lands, roadless, designated as “suitable for wilderness.” Countless species thrived there, and the human presence was infrequent and temporary, limited to those of us who wanted some form of wilderness recreation—hunting, birding, hiking, camping, canoeing, photography, or just sitting in the shade of a cottonwood tree watching fluffy white clouds float through a crystalline blue sky. And the ranchers and their cows, of course. Then came oil. In two booms, the Billings Anticline boom of the 1970s, fueled by the creation of OPEC, and the Bakken Boom of the 21st century, a product of horizontal drilling and fracking. And there went our wilderness. Eager to pour oil royalty dollars into the federal treasury, the government opened the grasslands to oil development, and today we have just 40,000 acres out of that million–about four per cent–available as “suitable for wilderness.” I’ve bemoaned these facts and numbers endlessly on this blog, and I won’t apologize, because it is important to remember and realize what we have done–to the land, and to the critters who live there—or used to. So imagine my joy to hear that a new organization was making its way into North Dakota, an organization made up of people who really CARE about those public lands, and are doing things to preserve and protect them. An e-mail from a friend in early January told me there was going to be an informational gathering—attractively called a “Pint Night,” and I know what pints are all about—in a downtown meeting room, sponsored by a group called Backcountry Hunters and Anglers. The group, my friend said, was interested in public lands in the western part of the United States, and access to that land for hunting and fishing, as well as other outdoor activities. “Oh, Damn!” I thought. Access. A bunch of crazy four-wheelers trying to find new ways to get their noisy machines into our roadless areas. I Googled them. Much to my surprise, it turns out just the opposite—the group wants to protect public lands and maintain habitat for the birds and animals who live there. The “access” issue they’re talking about is dealing with the purchase of large tracts of private lands, blocking gateways into these public areas—a more and more common practice across America’s West these days. Well, I thought, hooray for them. At the appointed hour on the appointed night, I drove to downtown Bismarck to learn more about these people. As I walked through the door and looked around the room, I got the feeling that about half of all the testosterone in North Dakota was gathered in one place. Perhaps 50 or 60 young men—big, strong, young men, most between the ages of 25 and 40, I’d guess, not the paunchy aging baby boomers we’re used to seeing at wildlife club meetings and DU banquets—had gathered to learn about these Backcountry Hunters and Anglers. The uniform of the evening was plaid flannel shirts, jeans and well-worn boots, and most were wearing baseball caps (with the brims pointed forward), with a smattering of battered cowboy hats. And there were a few women, also dressed like they were ready to venture outdoors, with their husbands or boyfriends, or on their own. The men and women were leaning casually against the walls of the room, almost all holding a bottle of beer, and a few sat at scattered tables, listening to a fellow, dressed like they were, talking about organizing to influence public officials. BHA’s trademark is these “Pint Nights,” a familiar scene in the 34 states and two Canadian provinces that already have their own chapters of the organization (including South Dakota), dedicated to the protection of public lands and waters, and providing responsible access to those lands and waters for Americans who want to enjoy our country’s great outdoor resources. I’ve been a member of a lot of conservation, sporting, and outdoors organizations (and now a member of this one), but this was the first I had heard of BHA. Founded in 2004 by small group of Montanans who saw a lot of problems with the management of our nation’s wild places and public lands, they came up with an idea for addressing the problems. They set out to create a grassroots organization focused not on protecting one specific species, river or hunting area, but on ecosystem-wide conservation across the continent. They wanted to create a voice for the silent wilderness. A wilderness they enjoyed as hunters and anglers. Today they have grown an organization approaching 20,000 members. BHA President and CEO Land Tawney (yes, that’s his real name), who was the one speaking that January night in Bismarck, and at subsequent gatherings in Fargo and Minot, to help launch a North Dakota BHA chapter, told me later that North Dakota’s been on his radar for a while, and now volunteers have stepped forward to help get it going. 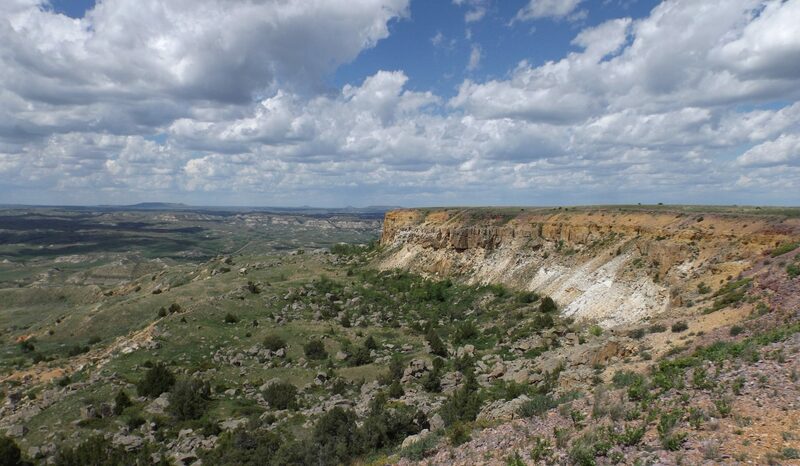 South Dakota’s chapter was formed in 2017, rallying around the issue of stopping the transfer of Black Hills National Forest land to the state for creation of a park in Spearfish Canyon. So far, they’ve succeeded, but the issue is long from resolved. One of the chapter’s founders, Jessie Kurtenbach of Deadwood, said the group will continue to work to protect Spearfish Canyon, and is also deeply involved in the South Dakota meandered lakes law controversy, as well as working to protect all of South Dakota’s 2.6 million acres of public land. Tawney and the North Dakota men, Senske and Leitschuh, are concerned about our federal roadless areas, and stress their importance to men and women who enjoy the outdoors. Tawney, a native Montanan and wildlife biologist with a B.S. degree from the University of Montana (and, he says, a Ph.D. in Post Hole Digging while fencing in the family quarter horses and mules), is a veteran of the conservation battles, spending time with the Theodore Roosevelt Conservation Partnership and the National Wildlife Federation before coming to BHA in 2013. Both he and Senske stressed that stopping the illegal use of off-highway vehicles in the National Grasslands is a priority. Senske, a Wisconsin native and restoration ecologist by training who works as an environmental scientist for the North Dakota Department of Transportation, said increased signage in the grasslands is a high priority, with an eye to protecting sensitive wildlife habitat. Wetland wildlife habitat and enhancement of the PLOTS program will also be high on the priority list in North Dakota. Additionally, at the federal level, Tawney says BHA maintains a presence in Washington, D.C. to keep an eye on outdoors issues, like monitoring attacks on the Clean Water Act, and preserving and enhancing the Land and Water Conservation Fund, a key funding source for outdoor recreation and habitat improvement in both Dakotas. Senske said the North Dakota group will be submitting a formal letter of intent to form a BHA chapter here in April, and they hope to have an active chapter here soon after that. Anyone looking for mores information, or who wants to become a member (dues are just $25 per year and that include a subscription to a slick quarterly magazine), can look at the organization’s website, backcountryhunters.org (just click to go there). North Dakotans who want to talk to someone about being part of the new chapter can send an e-mail to backcountryhuntersnd@outlook.com. The organization is a welcome addition to both the Dakotas. Our public lands need all the friends they can get. As Tawney says, they’re not making wild land any more. Next postA Full Moon? Easter? April Fool’s Day? Well, Kind Of.